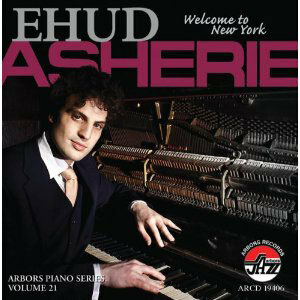 On Welcome to New York, his first-ever solo-piano collection, Asherie’s mastery of various masters’ styles, from Waller and Tatum and Dave McKenna on down, puts him in the elite group of heritage pianists who rode in on the wave of Wynton Marsalis traditionalism. The 13-tune playlist here is resourcefully thematic, not necessarily extolling New York as Asherie raids the Bernstein songbook for two more nuggets, “Lonely Town” and “Somewhere.” The latter ballad builds to a rhapsodic fantasia after a hushed, cathedral-like intro, cresting as Asherie tellingly floats the aching yearning of his right hand over the dark fatality of his left. Little delights like that are sprinkled everywhere, like Monk’s “Well, You Needn’t” in the middle of “Lullaby of Broadway” and a drop-by from the “Marines’ Hymn” in “52nd Street Theme.” Asherie studied hard for his first solo test.